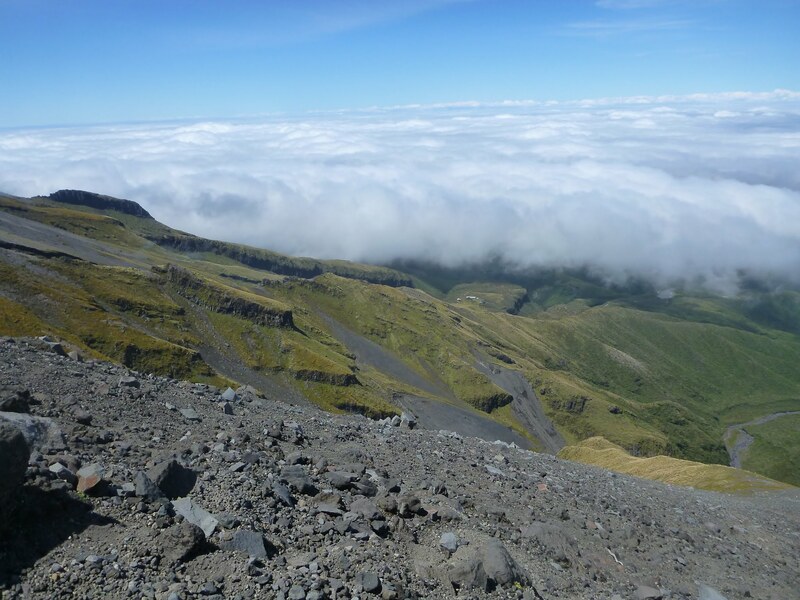 “4 to 5 days, 52 km, Advanced to Expert tramping route. 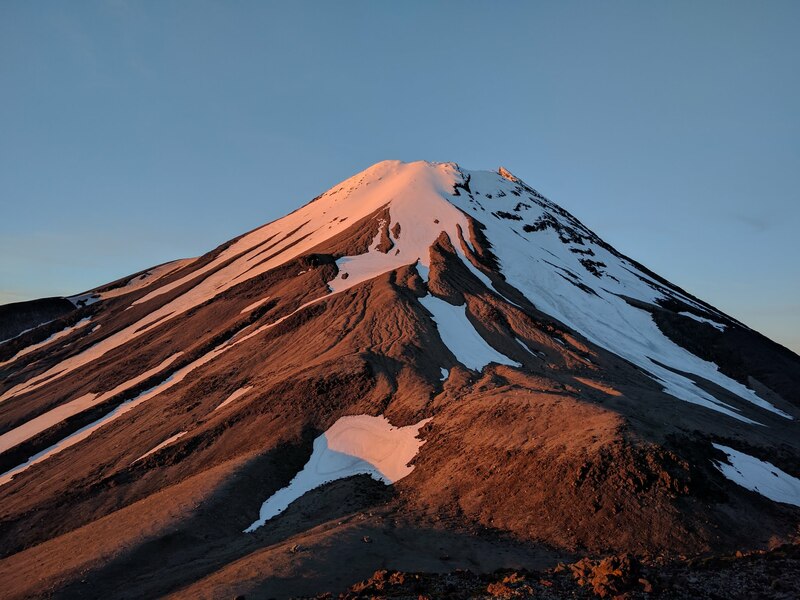 The Around the Mountain Circuit (AMC) is a challenging 4–5 day track for experienced trampers with backcountry experience and good navigation skills. 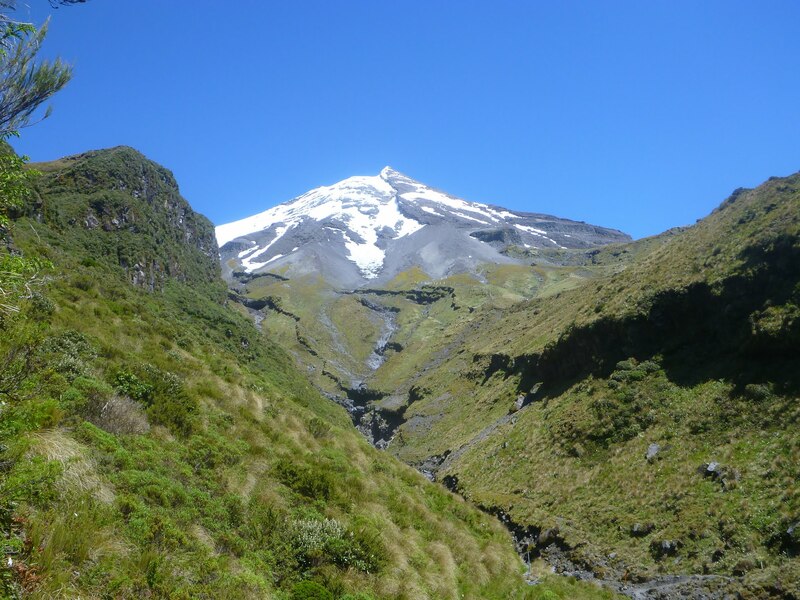 It passes through forest, rivers and spectacular alpine scenery. 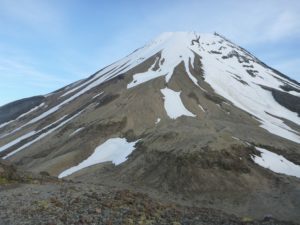 High and low level options exist for some sections, with higher level options recommended for their scenery. In winter conditions, high level tracks may be impassable due to snow. Lower level tracks are prone to tree windfalls and can be overgrown at times. 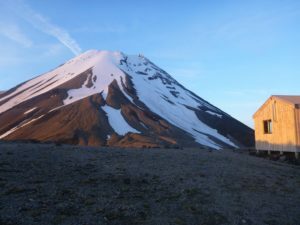 It looked good: the plan was to sleep at North Egmont on Friday night, and start clockwise: hike to Fanthams peak and stay in the hut on top, then down to Waiaua Gorge Hut, then to Holly hut and finish back through the Pouakai circuit. 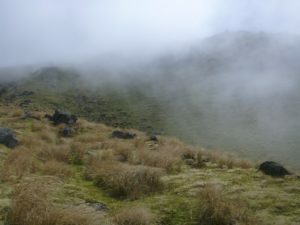 Well, when it was time to leave on Saturday morning, snow had fallen on Fanthams peak and the weather was not clear enough to aim for Syme hut, so we started the circuit the other way around, anticlockwise. Going steeply down from the visitor centre to the car park, then across a long swing bridge. 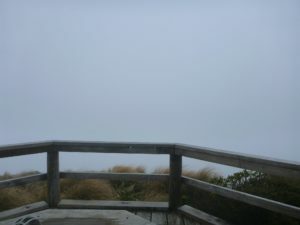 We went up through the forest, with a couple of view points, well more like non-view points with this weather! We walked up steps to Henry Peak, then around Maude Peak and eventually passed the famous tarns where a reflection of Mount Taranaki can be observed on a clear day. 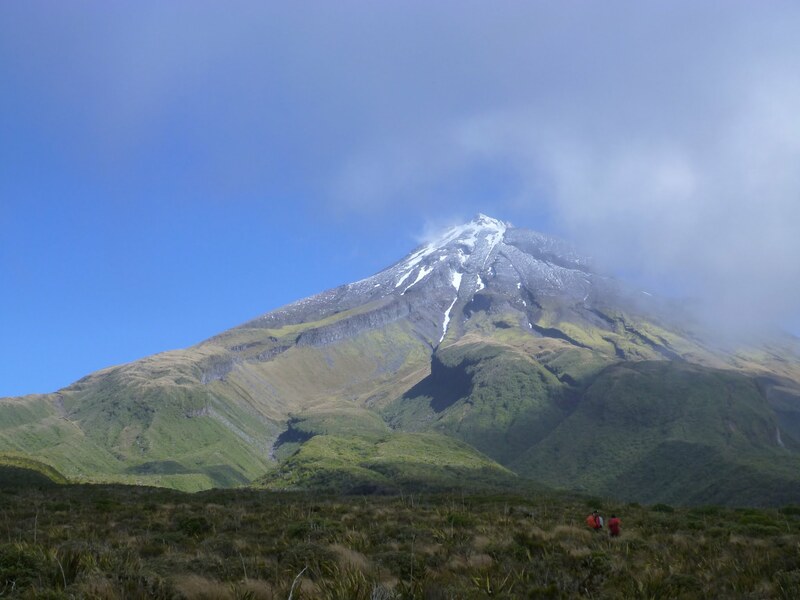 We kept going through mud and stairs and steps above the swamp to then crossing a bridge and finishing uphill to Holly hut, facing Mount Taranaki (finally!) without clouds for a little while. Christmas Eve’s dinner: dehydrated food in a bag (fish pie) , and red wine (Church road – cabernet merlot 2014) with dark chocolate for dessert. Day 1 Summary: we wore our rain jackets most of the track, did not see many views, lots of wind and a bit of mud. Our shoes were almost dry at the end of this first day. 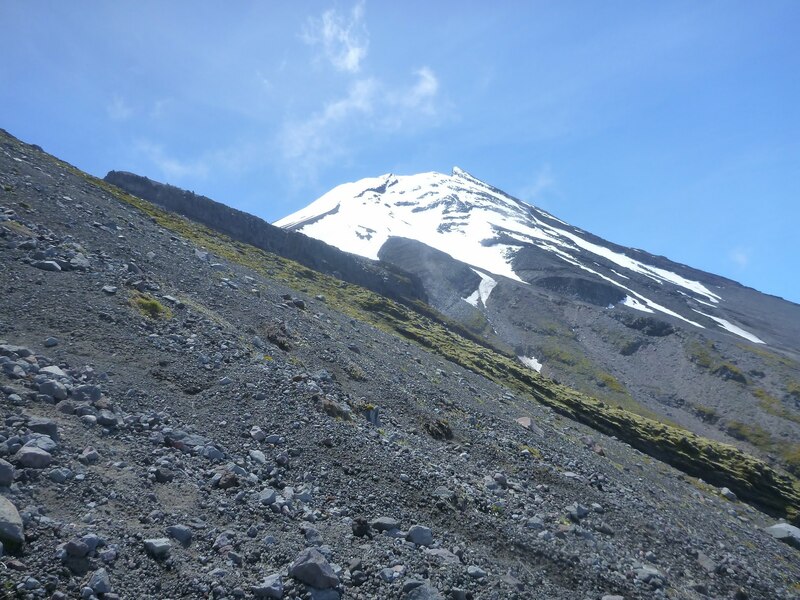 We saw The mountain once, which was more than expected in this weather. Started the days with 2 walking poles, ended with 3 pieces of walking poles. 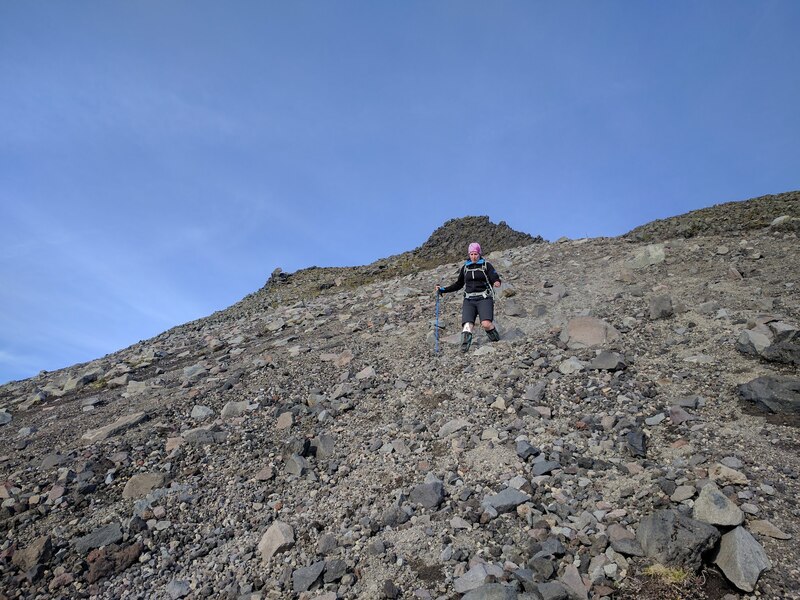 I slipped and fell on one, which is frustrating cause from that time I had only one to rely on and one split in 2 to carry in my pack! Cloudy? Foggy? Na… Nice view! 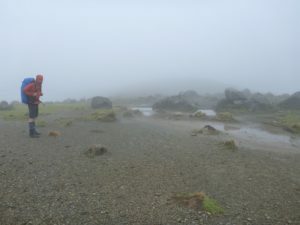 The weather forecast being “mainly fine”, we were optimistic when we got up. Unfortunately, it rained all day. 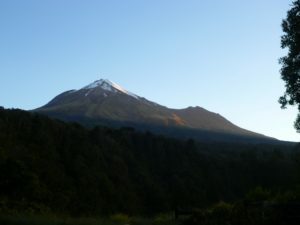 luckily, it was the day mostly in the forest, so the views on Mount Taranaki would have been a bit limited. A lot of river crossings, a real tramping track for this section, not as easy as the first day. Lots of mud, lots of climbing and crawling over trees, lots of passing over rocks, hands in the mud and using trees and grass to climb over. We walked all day with our rain jackets, the fine rain being continuous and making us wet pretty fast. 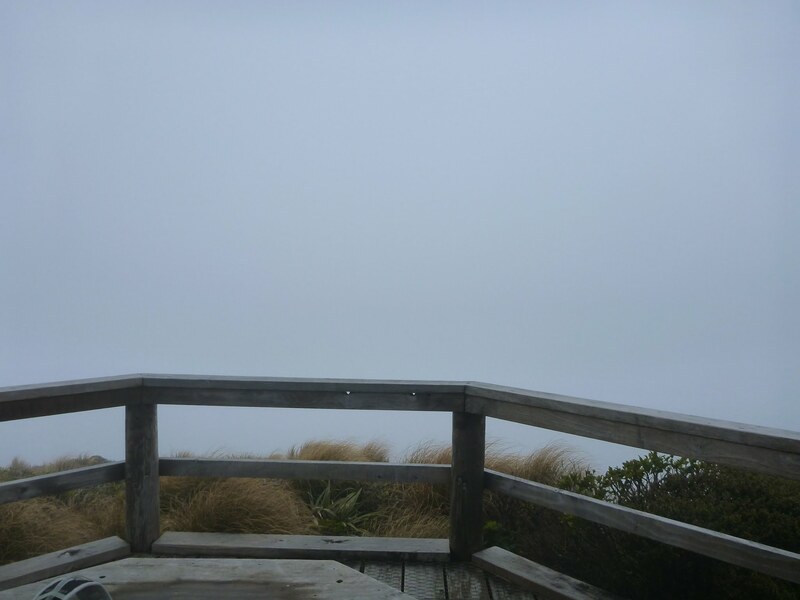 We got to Waiaua Gorge Hut (600 metres high) without seeing the Mountain. Lovely hut, with a warm fire, lots of space and interesting people to talk to and learn about the mountain and the different tracks. 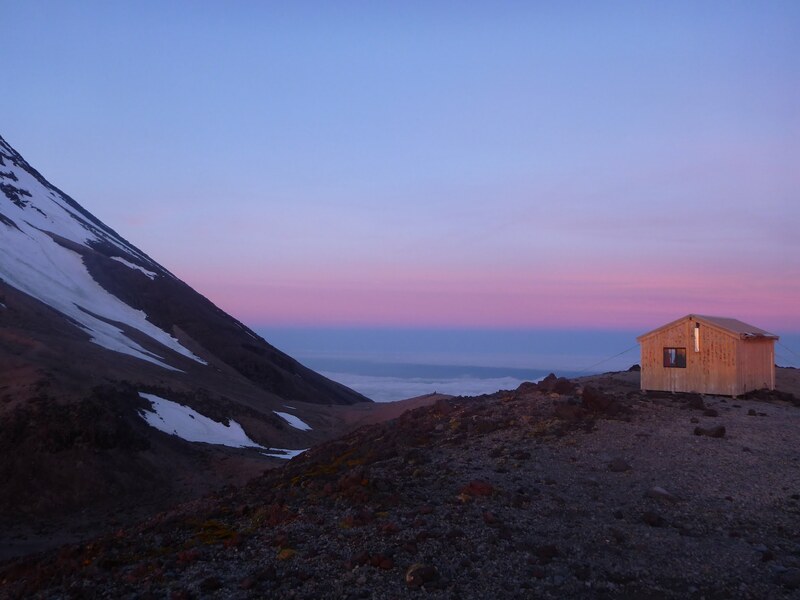 Early start, we got up at 6 am and enjoyed a beautiful clear view right outside the hut. 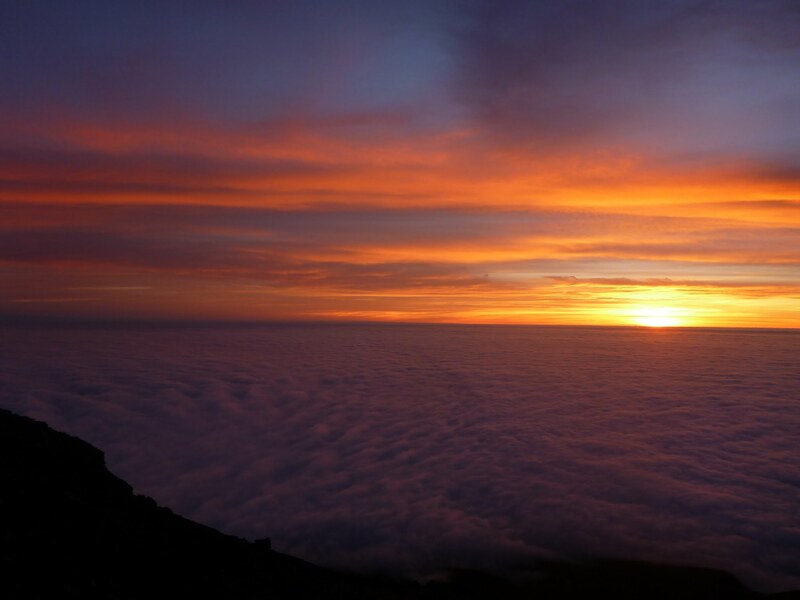 The sunrise on the side of the mountain was worth it, and made me happy and in a good mood! We had breakfast and packed, then started our long day. 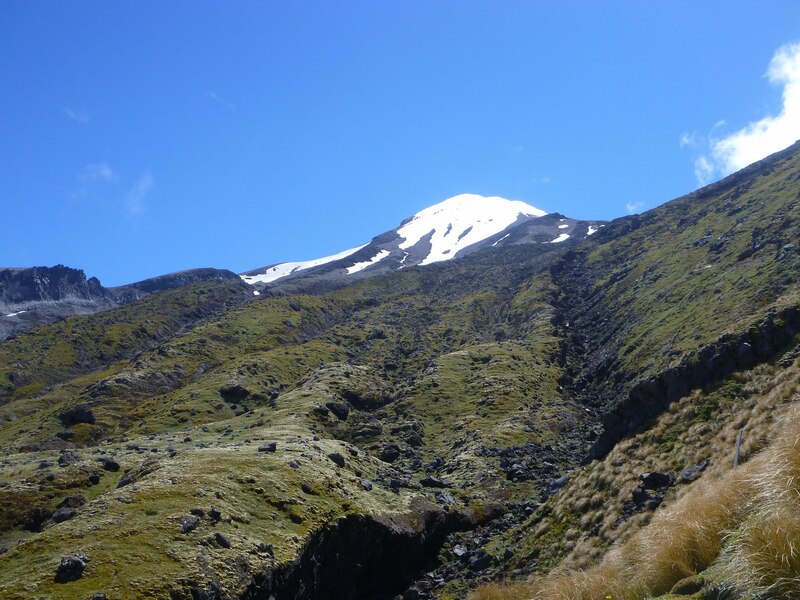 We were going for 1600 elevation today, about 9 hours walk, to Syme hut, the top of Fanthams Peak. 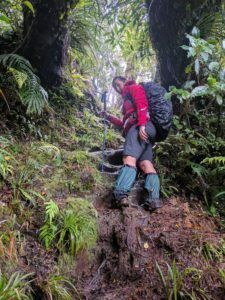 After we crossed the rivers, and got our boots and socks wet again, we climbed steadily to the Brames falls lookout, then steeply along a ridge (using hands to grab bushes to be able to climb up), until Bobs Ridge, where we passed right under the wall of rocks. 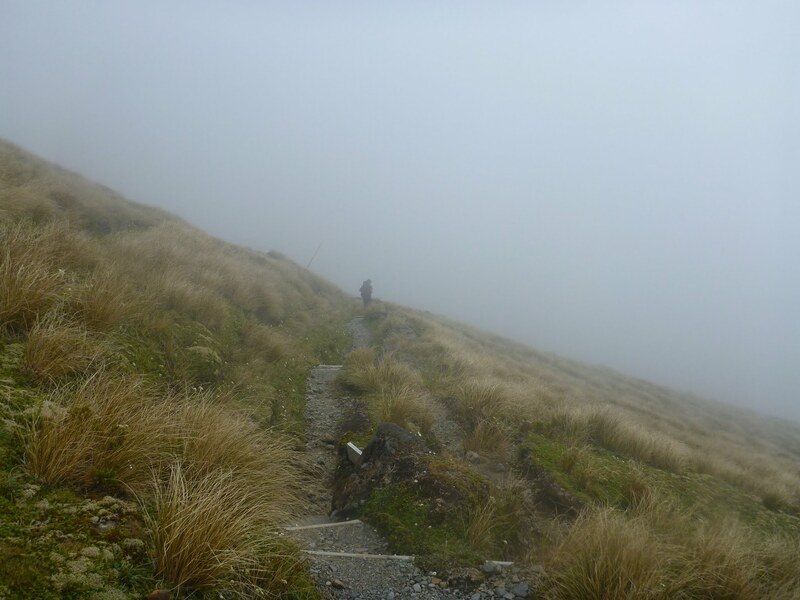 The fog/clouds caught up with us as we walked out of the bush line and made us look for the orange track marks and poles every step of the way. 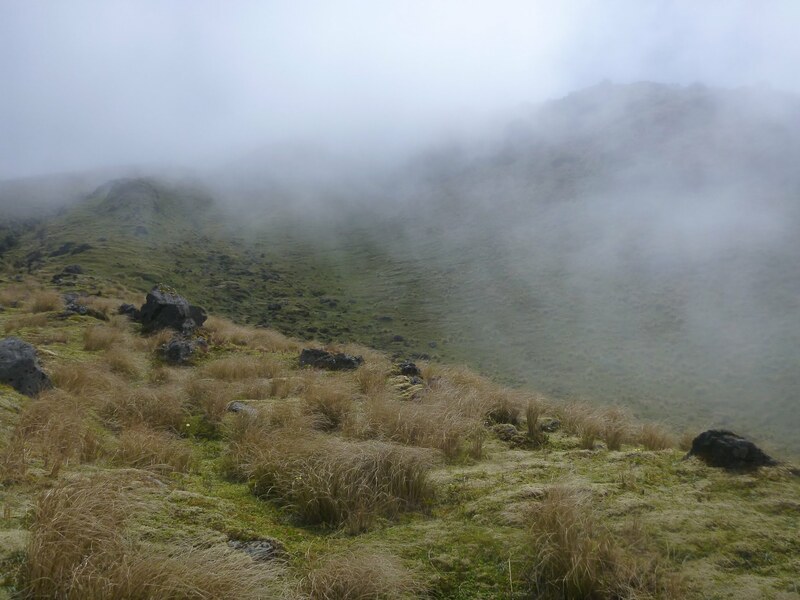 The clouds and winds played around a little, while we were walking through tussock covered land all along the south side of the mountain, until we were under Fanthams peak, at about 1500 metres high. Suddenly, the wind blew and cleared the mountain within seconds, for about half an hour. We used this opportunity to have our lunch break! 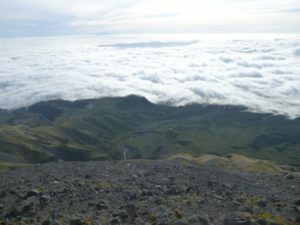 We kept walking, back in the clouds, back down a couple of 100 metres. Then we hit the Fanthams Peak route, and climbed steeply through the scree the remaining 500 meters elevation to reach Syme hut on top of Fanthams Peak. 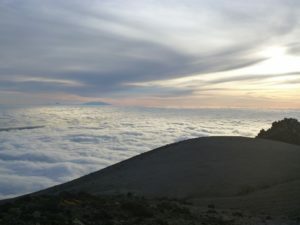 The clouds cleared up again as we walked up, and the rest of the day was completely above the clouds. 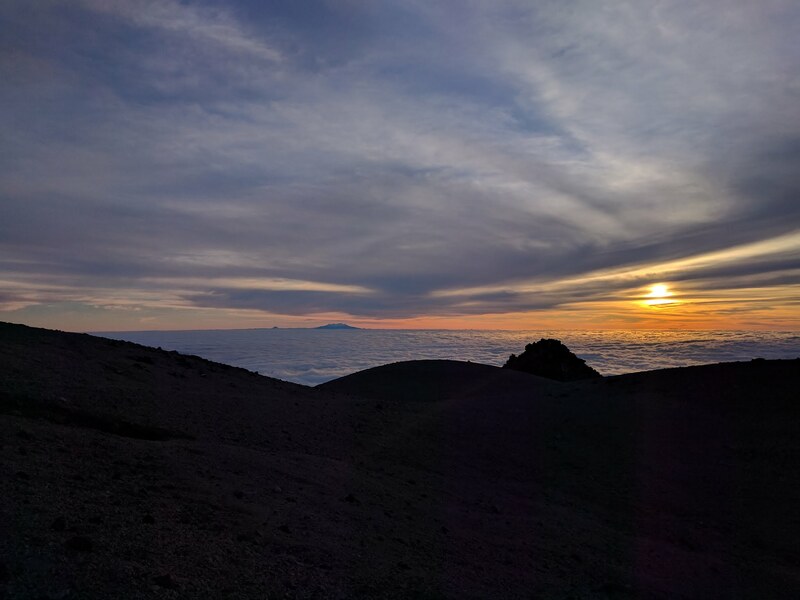 We got to the hut at around 4 pm, this was a long day, but probably the best one so far! 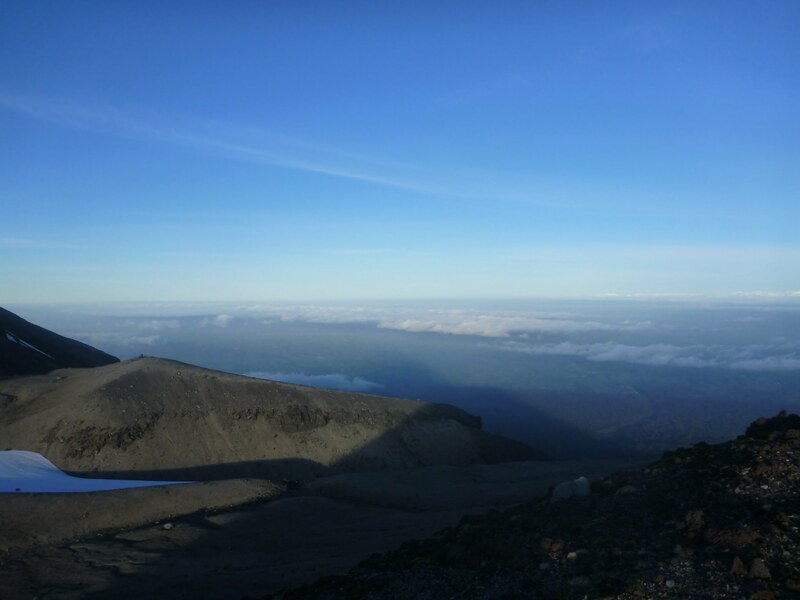 We enjoyed the views for the rest of the day, going to the toilet was each time an opportunity to get another glance all around. When sunset time came, I didn’t know where to look: the sunset itself and the perfectly flat sea of clouds, the color of Mount Taranaki, the bits of lands on the east side of the mountain that the clouds did not cover completely, or the shadow of Mount Taranaki and Fanthams Peaks on the cloud layer on the east side… You would have guessed, it was AMAZING!!! In the hut we met a couple of locals, a couple of Belgians and the French but Kiwi for 30 years who we met the previous night. Of course, after a sunset like this one, I wanted to see the sunrise on the other side! Jumping out of the bed as soon as I could see a sun ray (a little bit before 6 am), I walked around the hut and again, I wasn’t sure where to look! 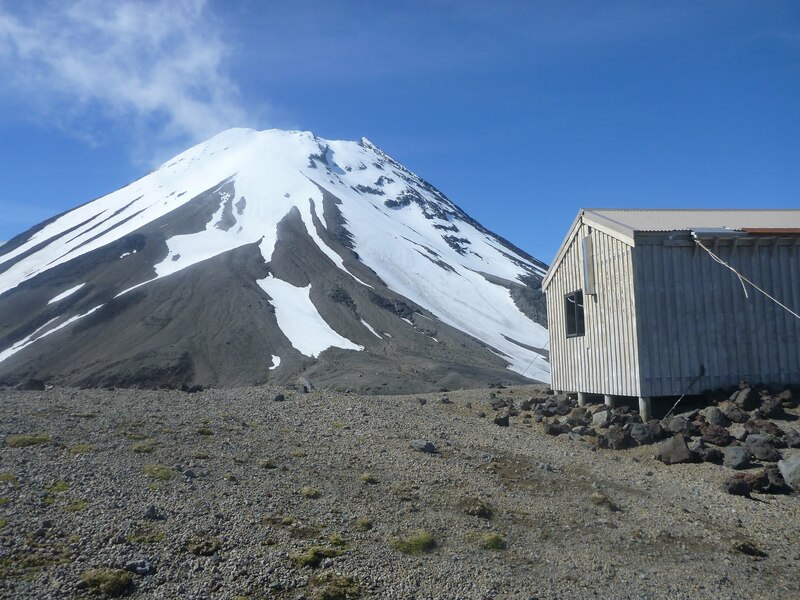 We could clearly see Mounts Ruapehu and Ngauruhoe, even from the long drop toilet’s lock!! Despite the low temperature, the day started really well. We left the hut around 7 am, and “ran” down the scree slope, hills first, making long steps, which was way faster than climbing and slipping backwards like the previous day. At some point we were gone below the clouds again. We walked up to East Egmont car park, out of the clouds, and then up along the east side of the mountain, to the ski field and to Tahurangi lodge. From there, this was downhill: we met the clouds again, and said good bye to Mount Taranaki. 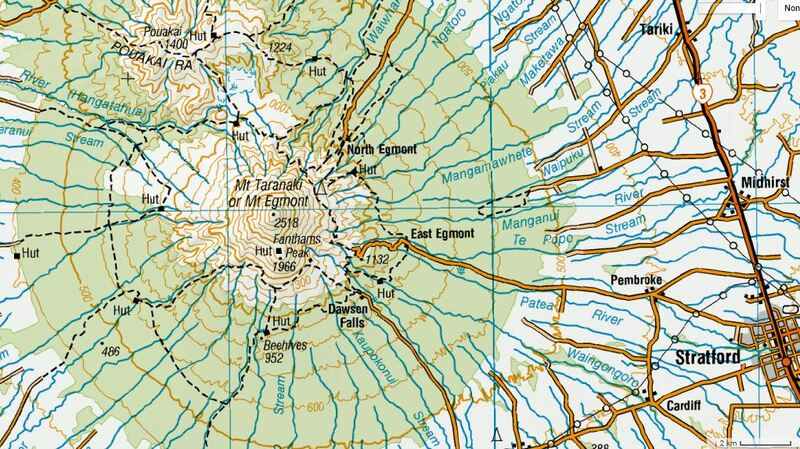 It was about 1,5 hour down, and we eventually found our car at the North Egmont visitor centre at 2 pm. The Mount Taranaki is still here! And here we are, hiking down back to the car, in the fog again! – We started here, but we went all around, we are finishing today. 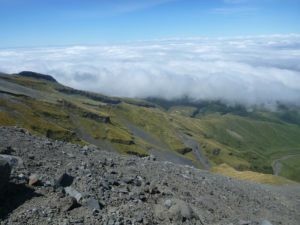 – No, the around the mountain circuit, all around the mountain. – (pointing at the Mount Taranaki – behind the clouds but it’s beside the point) The whole mountain? – Oh wooow, ok, how long did it take you? and we laughed. This is what happens when you meet people who have no idea you can actually go on an overnight tramp! 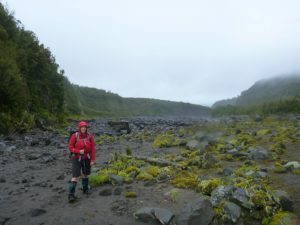 We were happy to stop walking, our legs were happy to stop moving, our feet thanked us to be out of the wet from river, mud and sweat and be out in the fresh air. We found a sink and washed up a little, before getting into clean clothes and hit the road to drive back home.